In early 2010 the Radio World magazine asked three RDS Forum members, who had a long-time experience in working with the EBU, about what was their view on the future of FM/RDS radio. Here you can download a PDF (2.9 MB) of their article published in the April 2010 issue of Radio World. Now comes something that is a bit of a surprise and it may contradict those that state that FM/RDS radio has reached a state of maturity that cannot be developed further and therefore the only solution for the future is the transition to digital radio. One of the advantages of digital radio, when compared to FM/RDS, is the significantly larger data transmission capacity, for example for the programme associated data. In 2010, the RDS Forum started to debate about expanding RDS. The new version will be called ‘RDS2’ and it will, because of three additional RDS subcarriers, have almost five times the data transmission capacity in comparison to conventional RDS. RDS2 will be compatible with existing FM/RDS receivers. However to use the innovation, new receivers will need an RDS2 decoder for the additional data streams. The technology mostly used now for FM radio and RDS decoding is called DSP and it has led to very low cost and mass produced FM/RDS receiver chips since at least one decade. With this same technology it is possible to easily decode also four RDS subcarriers at once instead of only one, still maintaining the low cost of the IC, as established now, on a similar market price level. It is also assumed that not all future FM/RDS radios will really need RDS2. Only the receivers that will offer the new enhanced services will need RDS2. These are the ones that are attractive for the broadcasters. For example, radio programmes will next to the Programme Service name of eight characters also be identified with a small coloured logo in addition. The PS can also be longer and use character coding that support all languages worldwide. This will improve the presentation of the unique station identity significantly. RT/RT+ will be possible in all languages. These are the ones that already serve the business of data service providers and enhanced performance can be obtained. Data service providers may want to expand their services and increase their revenue from the services on offer. From this the broadcasters and or transmission service providers can indirectly benefit and then there will be sufficient revenue to pay for the enhancements to be made on both sides. As an example, the RDS Forum mentioned enhanced TMC with 20 times more data groups transmitted than just now with conventional RDS. This will permit more regional and better local TMC information with a higher level of detail to be transmitted. When will RDS2 be ready for the market? This question is not yet easy to answer. The speed of this new development will clearly depend on the magnitude of interest that it can generate among all industrial partners involved. If they all would push that technology to deploy it quickly on the market, then 4-5 years will be realistic for a successful roll-out of both, the broadcast infrastructure and the receiver side to make it all quickly happen. It will be also necessary to promote widely the new possibilities offered by RDS2. The RDS Forum is prepared to accept this task and charged a working group composed of some of the best RDS experts to report their findings back to the RDS Forum in June 2015. 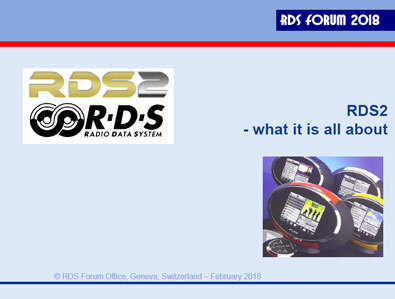 The working group met in Budapest in November 2014 and delivered a Feasibility Report in March 2015 that concluded that RDS2 is a project built on a very realistic foundation and in addition it will be much needed to support FM radio within the next 30 years. It was further agreed by the RDS Forum in June 2015 to set up two working groups in order to advance the introduction of RDS2. Working group 1’s task would be to revise and rewrite a new standard document for the RDS system. Working group 2’s task would be to write an upgraded UECP standard for RDS2. With Digital Radio gradually becoming available, will there really occur a time-window of opportunities for RDS2? To understand better this development, the RDS Forum has investigated the market penetration of digital radio (DAB family and HD radio as an alternative) and compared the market figures from a number of key countries with corresponding data about the development of FM/RDS radio over the same time period. The result thus obtained is still clearly in favour of FM radio and RDS. This trend is also not likely to change significantly over the next 10 to 15 years, neither in Europe, nor in the USA nor elsewhere in the world. Why? In times of an economical difficulty everywhere, there is neither money nor political consensus to build new large digital radio networks that can offer sufficient good area coverage everywhere. For the automotive market this is a primary condition to ensure that it will positively react. For the next decade at least it will be FM/RDS radio that will continue to dominate the world market and attract the largest proportion of radio listeners. Why? The technology is well established, works perfectly and is much less expensive to maintain. Therefore, under these particular circumstances, RDS2 will have a good chance and the RDS Forum is perfectly organised and motivated to make it happen. From a technological point of view, RDS2 appears to be a feasible extension in the mature FM/RDS landscape. The unanswered question remains of course of whether broadcasters and data service providers will go for this option, not yet really familiar with. However, as RDS2 is built within the RDS Forum upon using the 30 years past experience with using RDS, one can be confident that the new options available for stepping upwards to RDS2 will become easily available, using already existing infrastructures and technologies, and after all remaining fully backwards compatible as far as the billions of existing RDS receivers are concerned. Here you get a PDF of a very interesting presentation explaining what RDS2 is all about.